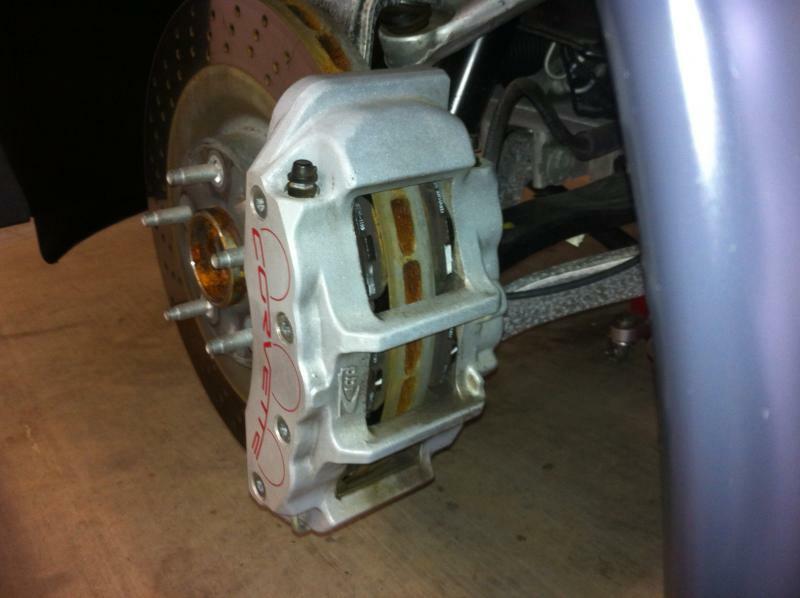 Finally got around to install my ceramic brake pads this weekend. Was easier than expected. The car has only 1200 miles so I'm sure thats why it came out so easy. 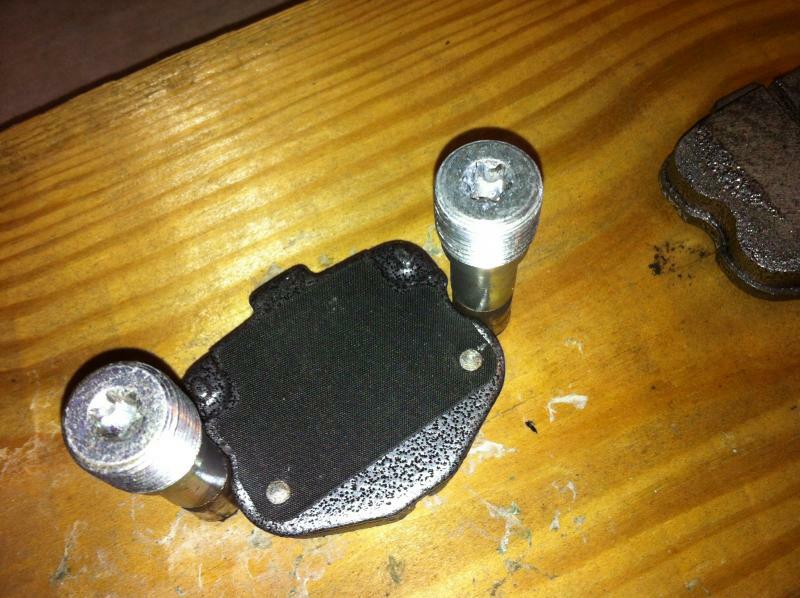 The paddlets I used were the Auto Zone Duralast Gold #DG1419A (rear), and #DG1419 (front). Payed around $90.00 for both after taxes. 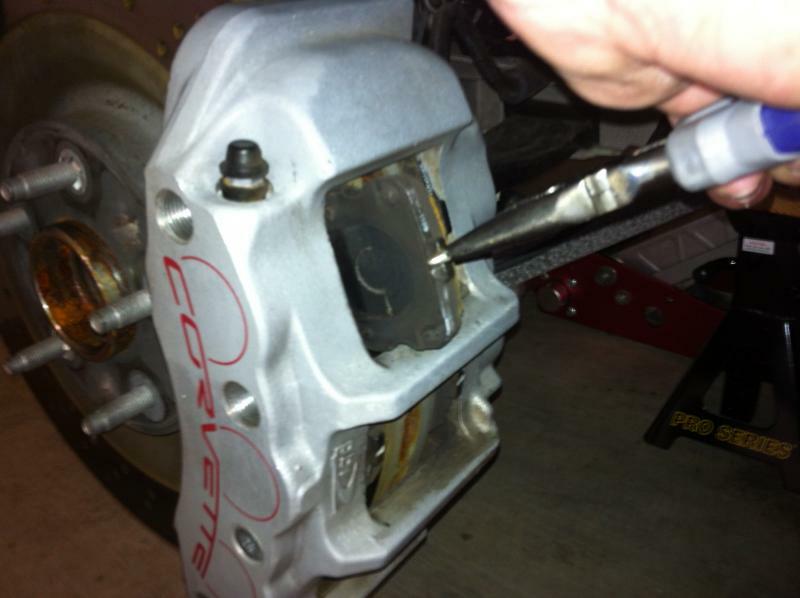 You can see the back of the calipers are open, for easy removal. Istarted at the top, removed four pins (two in front and two in back) using a T45 Torx wrench with a 3/8" drive. then you can wiggle the pads out using some needle nose pliers, grabbing the tabs. Working your way down, the last (bottom) pins can stay in, you should be able to remove and install over it. The bottom pad is the wear sensor pad, the metal tab faces up. This shows how the pins hold the pads in location. When you reinstall the pins, screw them in by hand, they should screw in freely. you may have to wiggle the pad while as you screw them in. Also I used a pair of pliers with rubber handles to push the caliper piston back enough so the new pads would fit, mine did not need to move much, with only 1200 miles on the clock, but for those that have much more I would recomend cleaning the calipers around the piston to ensure no brake particles don't damage or scratch your pistons. Last edited by Eric ray; 01-07-2015 at 05:30 PM. Excellent post for me so thanks. I am doing this weekend on my 12 GS when I get home from San Antonio. I picked ip the same pads at Auto Zone yesterday. do these pads put out less dust than the stockers? When the dust boots are in good shape (like yours are) the dirt on the piston will not get cause any damage to the piston seal when you push the pistons in. Once the dust boots start to fall apart the dirt can get behind them and can cause piston seal issues. Tracked cars see bad dust boots quite often and most people don't replace them once they have burned off. so did they make a big difference in brake dust? Driving to Kerrville Tx. tomarrow, to ride the twisted sisters, I'll put them to the test and let everyone know how the brakes handled, and any dusting issues. Have used the Auto Zone dura last on both my previous C-5 and current Grand Sport, you can't believe the reduction in dust. Also no need to clean the wheels after every use to prevent the metal dust from rusting and marring the wheel. Its a good thing I decided to do this this weekend, look what I found.Going to San Antonio this weekend. Also i would assume it would be the exact same steps in my 2011 GS right? 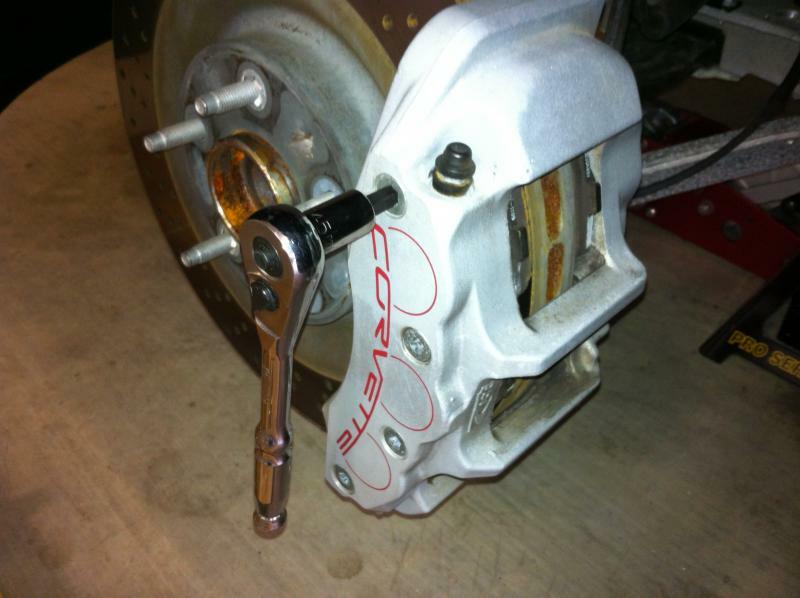 Something not mentioned here...... Do NOT use brake cleaner on the calipers. It will run the Corvette logo paint! I nearly wiped it off mine before I discovered this. 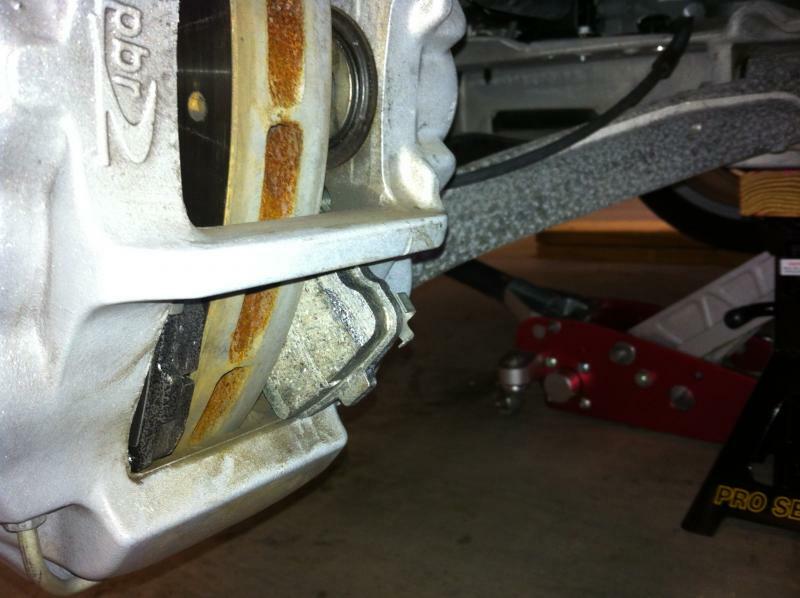 Quick Reply: 2013 G/S ceramic brake pad install.